Communicating with your customers and streamlining your calendars have never been easier with Ignite’s text messaging feature. From Ignite, send appointment reminders to your customers on a platform they are frequently checking – their mobile devices. Text message reminders prompt your customers to confirm or cancel their appointment and, what is best, their response syncs up with your Ignite service calendar. 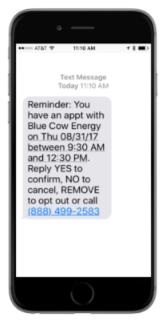 Available at an additional cost, text messaging appointment reminders will help ensure your technicians and service team have less cancellations and are having the most efficient days possible. Blue Cow Software is here to help you stay on top of trends that help you successfully reach your customers while keeping business simple. Have you added the new two-way SMS/text message capability to your Ignite Software Suite? Join the 7%. Contact Blue Cow Software to learn more and purchase this add-on.